Professional Window Cleaning in London. The windows of your house are getting so dirty that you don’t dare open the curtains? Why not solve your problem, quickly, efficiently and at an excellent window cleaning price? Just call Thomsons Cleaning, which offers a variety of professional window cleaning services to both residential and commercial customers in London. The professional cleaners can offer you outdoor cleaning with water fed telescopic poles, or rope access for windows higher than the 4th floor. The company also offers professional indoor window cleaning as well. All the cleaners are very thoroughly vetted, trained, and perfectly equipped for providing the highest quality cleaning services. All cleaning services are insured, and all solutions and machines and tools used are Prochem certified. To get your personalised, free price offer for window cleaning, just call the 24/7 customer care service here 020 3746 0000 or send an online request with a description of the number and type of windows you want cleaned. The customer care operators will be back to you with a price offer, and are also available to answer your questions in regard to the windows cleaning as well as the other types of services you can book at the same time. The company offers high quality, professional outdoor and indoor residential and commercial windows cleaning services in London. The window cleaning is quick, efficient, and has a lasting effect. Outdoor windows up to the 4th floor can be washed via special telescopic water fed poles, with purified water and without the use of intrusive ladders. Windows above the 4th floor can be cleaned by the professional rope access window cleaning teams of the company. The professional cleaners can also clean all indoor windows with the help of ladders, squeegees and efficient and safe glass cleaning solutions. All cleaning services are fully insured, and all of the prices are fixed. 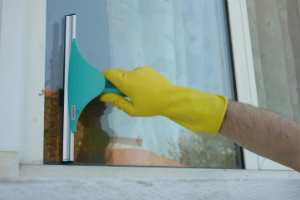 The company offers a very quick, safe and highly efficient outdoor window cleaning service. The conditions are to have windows which are accessible and are up to the 4th floor. The cleaning team needs to park the van up to 30 meters from the windows, so this is something you should keep in mind. The purified water tank is in the van where it is pumped from to the telescopic poles used for washing and rinsing the windows, as well as the sills and frames (if they are from PVC). The purified water has no minerals in it, so there is no staining and streaks after the windows dry off naturally. The purified water in fact helps protect the windows from accumulating dirt and dust for longer than conventional window cleaning does. This windows cleaning service can be combined with gutter cleaning or patio cleaning. Combined booking brings serious discounts! The professional cleaners can clean all kinds of windows, as long as they are accessible. This includes: bay windows, sash windows, double windows, skylights, doors, conservatories and conservatory roofs. The cleaners can remove stickers from windows, upon request as well. The company offers full tenancy cleaning packages, which include window cleaning, as well as removals, packing, deep carpet cleaning and end of tenancy cleaning. The services offered can be combined as you wish, and the more services you choose to combine - the bigger the discounts will be. Don’t hesitate to book your professional window cleaning service you need at the best window cleaning price in London right away! Call the customer care service right away at 020 3746 0000, or send the online booking request by filling the simple form here, and you will receive booking confirmation via SMS and e-mail within two hours. The customer care service is available 24/7, and will answer any questions related to the services offered, as well as the discounts you can receive for combining them. You will have to pay a fixed fee after the cleaning has been done. A wide variety of payment methods are accepted. Book your windows cleaning service for the same day or for any day of the year right away!